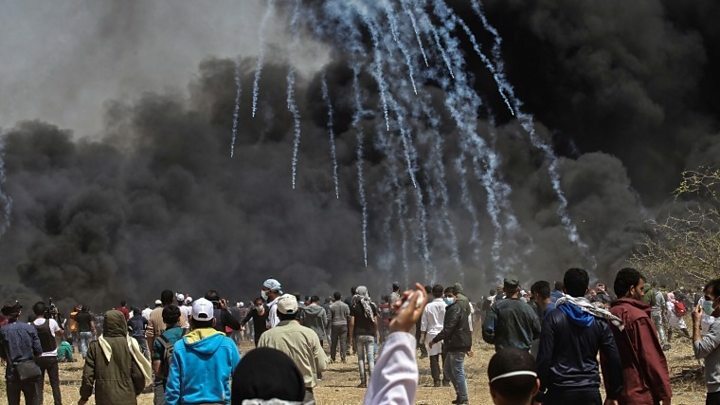 Piles of tyres were set on fire in an attempt to create a smokescreen to block the view of Israeli snipers, as thousands of protesters gathered at five sites along the 65km-long (40-mile) Israel-Gaza border for fresh protests on Friday. Gaza's health ministry said a 16-year-old boy was among those killed by Israeli gunfire, and that more than 1,300 other people were wounded. The group has said it will pay $3,000 (£2,140) to the family of anyone shot dead by Israeli troops at the protests.